Just received a phone call from the Genetic Counselor. 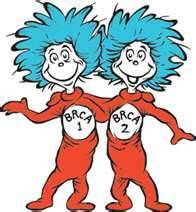 My blood test results came back and I tested negative for the BRCA1 & BRCA2 gene mutation! It’s great news to know that it doesn’t appear to be hereditary. They did tell me to keep in contact with my doctors in the future to see if any new genetic tests become available. There is always a possibility that it could be something they haven’t discovered or are able to test for yet. So the down side of being BRCA1 & BRCA2 negative is that there are still no answers as to why I developed breast cancer. It could very well be they will never know. It could also be environmental. Which is what I suspected in the beginning mostly because I don’t really have a family history that would indicate cancer. Maybe it’s time for a serious look at what exactly I am eating. It sure can’t hurt to eat healthier! Thank God its negative! I love your positive attitude baby!